Are children who are exposed to more than one language from birth at an advantage or a disadvantage when starting school? strategies for exploring the learning of multilingual learners and a review of the resources and activities that could help. 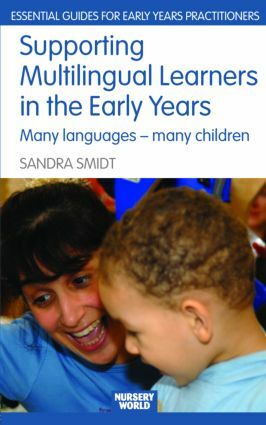 Sandra Smidt views multilingualism as a cognitive advantage and shows how Early Years practitioners can use interactive styles of learning to focus on the benefit that the many cultures and languages in the classroom can bring to children’s learning and development. Written in a highly accessible tone, this book offers practitioners a mix of practical case studies and examples in which theory is embedded and its importance explained. Students of early childhood education will also appreciate the author's carefully structured approach to the topic, as she includes summary boxes, glossaries and points for reflection in each chapter.